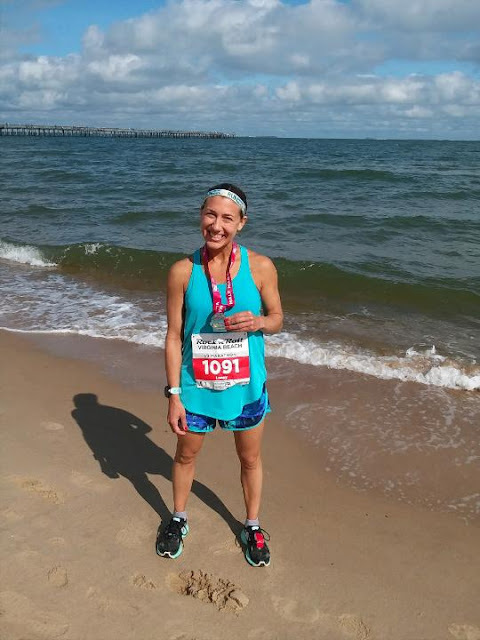 Hi guys, I know I've been MIA most of the summer but I wanted to pop in and share my VA Beach Half marathon experience. 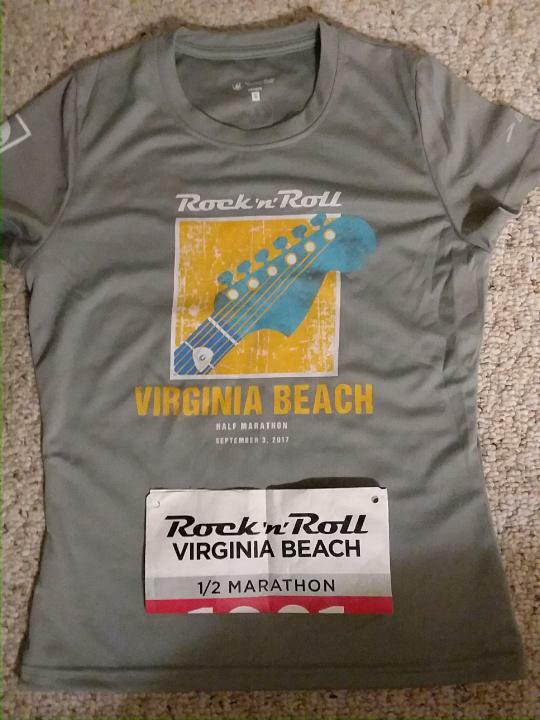 Rock n Roll Virginia Beach is one of the races I always look forward to. 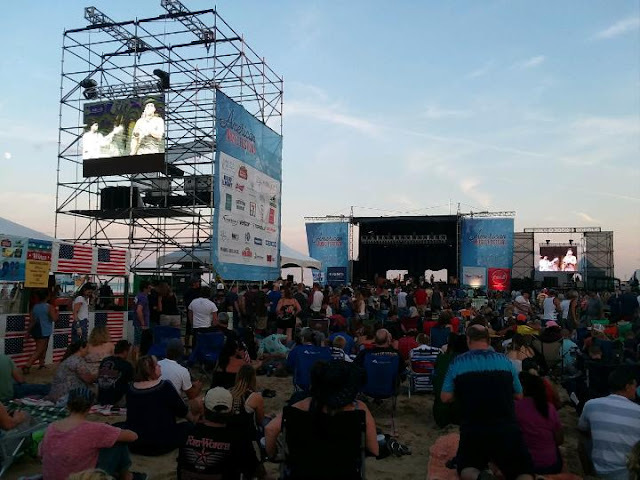 It's a fun weekend with all the bands that play each night at the oceanfront. Although this year, I just wasn’t feeling it. The weather was gloomy and rainy the start of the weekend and it continued that way through Saturday evening. Luckily it did cool things off for the race on Sunday so that was nice. And no rain race day, even better! Friday, I found out that the band 311 got canceled due to weather. Two years in a row this band got canceled! The expo wasn’t even that great or maybe I just felt that way because I have been to so many and they are pretty much all the same. Usually Rock n Roll puts on a good expo and they have interactive activities in the Brooks area, but there was nothing but a bunch of space this year. As you can tell, I didn't even take any pictures. I knew there were no upcoming races for me so there wasn’t any need to purchase anything else. 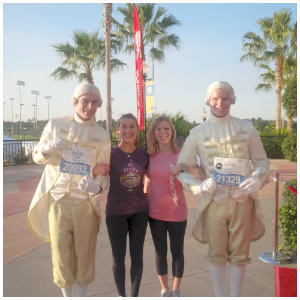 I grabbed my bib and shirt, and I was out of there. Saturday I wasn’t even going to plan on going to the concert anyway even if it was nice because I wanted to get a good night sleep before the race. Turns out the concert had moved into the Convention Center due to the weather. It was a band I didn’t even recognize so no loss there. Sunday morning I woke up much earlier than I anticipated. I had a coffee and bagel then I was out the door. Normally the race starts at the Convention Center but this year it started on 14th street so we wanted to leave a bit earlier to make sure we found parking. Luckily I still had my parking pass from when I worked at the oceanfront. I wasn’t sure if it was going to work, but we were able to swipe right into the garage. Score! It was only a few blocks from the start line, so that worked out perfect. The restaurant is connected to a hotel and we were able to even go in to use the restroom. We arrived at the starting line in plenty of time. I hate getting to a start too early and then just waiting around, but better early than late. My run buddy and I decided we weren’t going to run together this year because I didn’t want to hold him back. 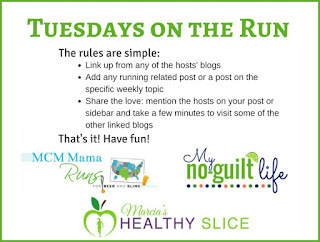 He was planning to do a training run to prepare for his marathon the following week (it is Erie, if you’re curious). After the countdown the first corral was off. I made sure I was in the back of the corral so I didn’t start out too fast. That didn’t help any. I felt like I was running effortless and I looked down at my watch and I was about 40 seconds under what I normally run. Ok Lace, you need to slow down or you’re never going to be able to make it through, I told myself. Usually at races I set my watch to beep so I know if I am above or below a certain pace. This time I forgot so I had to continue looking down at my watch to make sure I wasn’t going too fast. I finally settled in and found a comfortable pace I could keep. Miles 1-6 the temperature was comfortable and I was feeling good just cruising and singing along with my Ipod. I thought I should stop to get a drink, since I never carry any water. I don’t know why but Gatorade sounded good to me at the time so I had that and washed it down with some water as well. If I plan to stop at an aid station, I do stop. I move to the side so I am out of the way and drink. I find I don’t lose that much time by stopping and drinking for a few seconds, rather than trying to run and drink and spill more down the front of my shirt than in my mouth. Usually the half way point is where they hand out GUs but this year they were handing out GU gummies. I grabbed a pack but then realized the pouch was going to be too hard to open on the run and then chewing gummies sounded like too much work. So, I quickly threw it back to one of the volunteers because I didn’t feel like carrying them the rest of the way. I was about at mile 9 and usually by this time I would have had a GU. I even had one I brought in my pocket (just in case). But I didn’t feel like I needed it, so I just stopped at another aid station for some more Gatorade and water. I was coming up on mile 11 and the temperatures were much warmer than the start. I thought maybe I should have that GU. But I only have two more miles so I can just push through. And then I saw them…ice pops! Now I am not one to usually take things like that along the way, but I thought why not? And that is just what I needed. I did feel like it gave me a little more pep in my step. Those last two miles flew by (and yes I ran while eating it). I thought well I wasn’t going to break the time I had last year so let me just enjoy it. That ice pop was so refreshing and even cooled me off a bit while the sun was beating down on me during this time. After one incline over the bridge I was in route of the finish line on the boardwalk. I crossed the finished line 3 minutes slower than I did last year. But I was perfectly fine with that since I haven’t been running much due to my crazy work schedule. I’m glad that fall is coming and things have settled down which will allow me more time to get my runs in. After I crossed the finish line, I found my friend, took a quick picture, then it was off to brunch. We didn’t stick around for the bands that were playing because we knew we were planning on coming back that evening for the headliner. The Wallflowers opened for 3 Doors Down. I was so exhausted from the day that I even thought about not going back for the concert. But that is why we do this race to get into the concerts for free all weekend. Once there, I was happy I decided to go and knew a lot more songs than I thought I would. 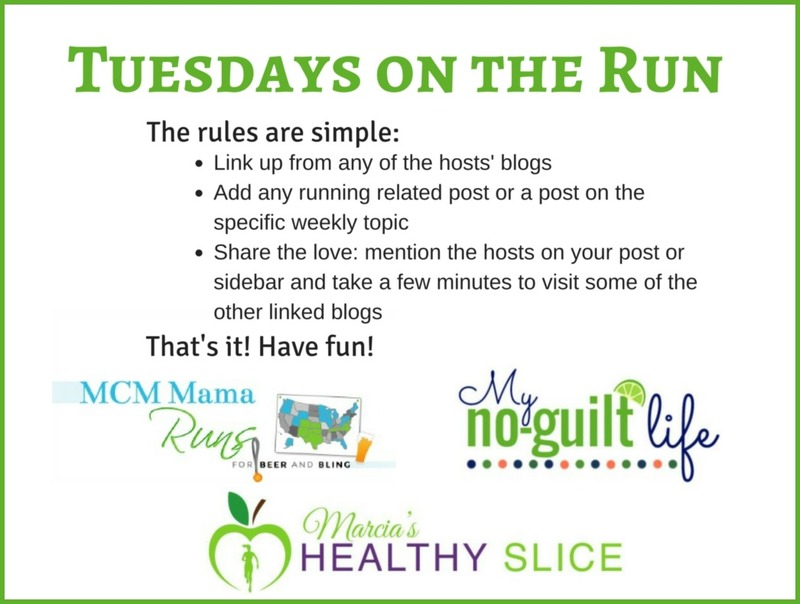 We will be linking up with the gals from TOTR! LOVE that photo of you coming through the finish line! What a brilliant shot! Sounds like that ice pop was exactly what you needed at that moment. Well done on another great race. Thanks! Yes that ice pop hit the spot! You look really strong! I don't think I've done any race 6 times -- the ones I do multiple times are the shorter ones. Isn't it nice when you try something new & it works?! Yes, even though they say not to try something new race day. I want to run this race someday, but the thought of dealing with traffic back from the beach always makes me decide not to run it. Nice job on a steady race. This was the first year that it was closer to the oceanfront. Usually it is at the Convention Center and there is always plenty of parking there. What an awesome finish line photo! Sounds like a great race--and you had the perfect attitude going in. Congrats! Yea, it went a lot better than I was thinking it would. Weather did help. 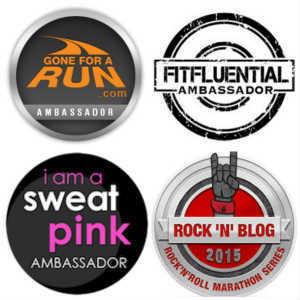 Congrats on running a smart race! Interesting how RnR pulled back on that expo this year. I found the RnRSTL expo to be minimal at best last fall. Oh how I wish they'd stop with those grey shirts! Yeah grey in't my favorite color either to work out in. Congrats on the race! I really like the shirt design and including entry into the concerts sounds like a nice fringe benefit for this race. I like the shirt design, not so much the color. I've heard big things about the RnR expo, but I'll be OK with it being minimal for Vegas. I don't need anything, and I'd be fine with not buying anything that I would just have to pack in my suitcase. I have other things I want to bring back to Denver from Vegas, so I need as much room in my suitcase that I can get. Oh Vegas Rock n Roll expo was pretty good. Be sure to pack an extra bag! Great recap! I'm not as fast as you, but I know that feeling of struggling to run "slower" than what your body is wanting to do. Running slow is way harder than running fast sometimes LOL Great job! Congratulations, on what I am sure was, an awesome half marathon! The 6th year doing a race sound amazing! even if it does get a little boring. It was still fun and I'm glad I ran it. Yes. You should definitely do it. It's a great race. Great race pictures! Bummer that 311 was cancelled. I feel the same way sometimes about races that I repeatedly run, like runDisney, lol. Yea that's how felt with Disney races as well. I am taking a break from those. Not sure if I will run this one next year or not. Oh, ice pops would be amazing at the end of a race! This race was my very first DNS ages ago because I ended up having to work over Labor Day weekend. That scared me off destination races until this year. I'm just not sure it's worth fighting that holiday-weekend-95 traffic for! Oh yes 95 can be brutal anytime but especially on a holiday weekend. What a bummer that one of the bands that you were looking forward to hearing canceled...again! 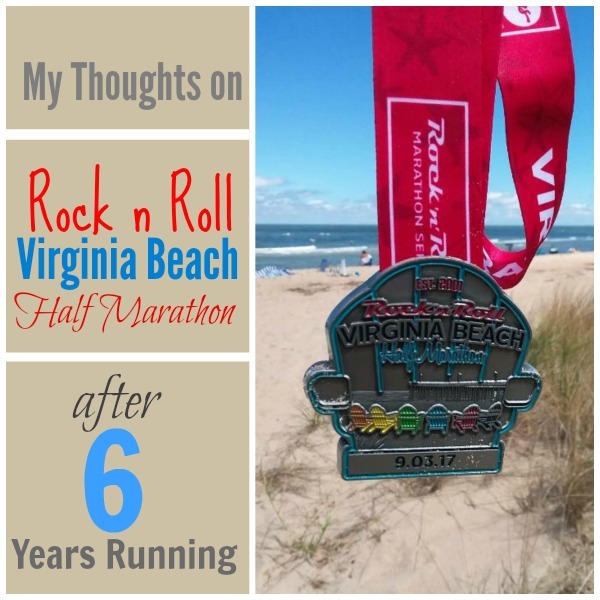 I have always loved the vibe of RnRVB, and though I was sad to miss out this year, skipping this year's race was the right decision after a summer full of travel. Hopefully I'll be able to run it again in the near future. One of the highlights of this particular race weekend is being able to close out summer at the beach. It has been one of my favorite races to run because it is a local one. But I have still traveled for it in the past when I haven't lived here. Congrats on the race, Lacey! Honestly, I felt the SAME way about RnR New Orleans Expo this year - it wasn't really exciting at all (like it usually is).